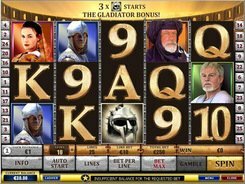 The 5-reel 50-payline Gladiator slot released by Playtech is based on a fabulous Ridley Scott’s movie of the same name. The coin value is fairly low ranging from $0.01 to $0.20. The max bet per spin is $100, and the coins jackpot equals 5000. The gladiator helmet is the wild symbol appearing on three middle reels only and substituting for other icons. 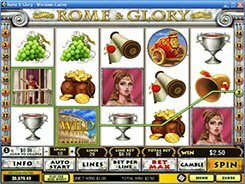 If three wilds occur on line 2, 3 and 4 simultaneously, you start a Gladiator Bonus with cash prizes hidden under bronze, silver and gold helmets. 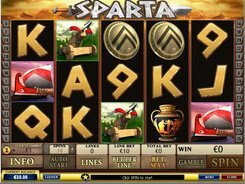 Another stunning feature in the video slot is the Coliseum bonus triggered by three scatters. 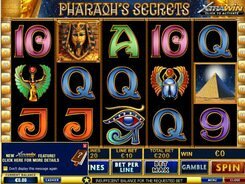 You can win a variety of prizes hidden under the tiles, including extra scatters, extra wilds, multipliers and free spins – all to boost your wins. PLAY FOR REAL MONEY!